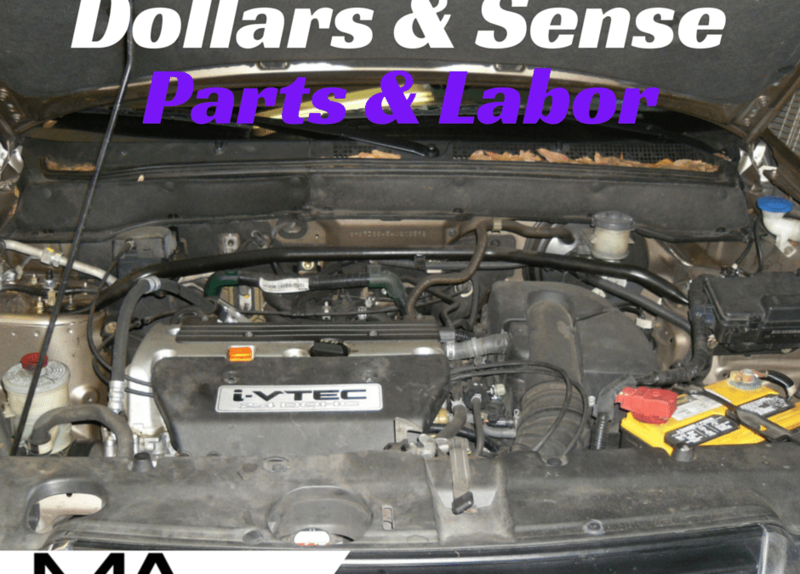 Dollars & Sense: Why Do Labor & Parts Cost So Much? by The Mechanic's Wife | Feb 28, 2015 | Did You Know? Your stomach drops (and maybe your jaw does, too). You begin mentally calculating how much money you have in your bank account, the date of your next paycheck, and then you wonder if you’ll have to dip into your savings to pay for this auto-repair bill. Suddenly, you begin to question everything. Can I really trust this mechanic? Was the problem really important enough to fix now? Should I have gotten an estimate from another repair shop to compare? In this final post of the four part series, Dollars & Sense, I will explore the cost of parts and labor for automotive repairs. Parts, parts mark-up and labor are the main components of an auto-repair bill. Labor and parts mark-up are how most shops make money. These charges pay for overhead costs – utilities, tools, diagnostic equipment, information systems, etc. – and the shop’s employees. The question is, how do these charges get decided? The first thing to know is that not all parts are equal. Asking, “How much does a radiator cost?” is too simplistic. For example, when you buy a pair of jeans, you may consider spending more for a pair of Levi Strauss brand jeans because they are known to last for many years. A cheap pair from a super-mart are likely to wear out more quickly, thereby costing you more money over the years. Similarly, automotive parts have different brands with varying levels of price and quality. A cheaper part might seem appealing today but is it worth the time, money, and your family’s safety if it fails prematurely? Most shops buy parts at a commercial rate and mark them up for a profit. This can be a controversial issue which will be discussed in future posts. What you really need to consider is, when you pick up your vehicle is the total amount due a fair price? One shop may mark up the parts and charge a lower labor rate and another may do the opposite, but the total bill could equate to the same amount. This is another complex issue deserving a blog series of it’s own. Shops might charge a labor rate of anywhere from $70-$120. You may say, “What? Mechanics must be rolling in it!” Please remember, this is not take-home pay for the mechanic; the total labor covers a variety of expenses for the business. Most mechanics only receive $15-$25 per labor hour and often flag (or log) less than 40 hours each week. Every repair takes varying amounts of time depending on the setup of the vehicle and its condition. My husband jokes that he married me despite my owning a car which was challenging to work on (said car shall remain unidentified for the security of other such models). There are industry guidelines for estimating the time it takes to do each repair but these times should be adjusted based on experience and the condition of the vehicle. What is important is whether the number of hours billed reflect a fair representation of the time it actually took. There is no cut and dry formula for whether to mark up a part and how much, no more than there is a correct labor rate. The rates should be decided based on the shop’s operating costs, fair wages for the mechanic, and the best interest of the customer. If you have more questions about this or any of the topics covered in the Dollars & Sense series, consider talking to Andrew during his Ask-a-Mechanic hours or email him at m.autosvc@gmail.com. Ready to bring in your car for an estimate? Schedule an appointment.